John and Rico's Antique Furniture from The Drawing Room of Newport. #4835. 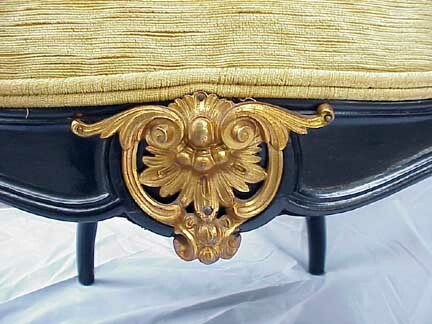 A parlor chair att to Auguste-Émile Ringuet-Leprince similar to furniture in Chateau sur mer in Newport Rhode Island on Bellevue Avenue and a chair in the The Metropolitan Museum of Art in New York, New York. # 4835. 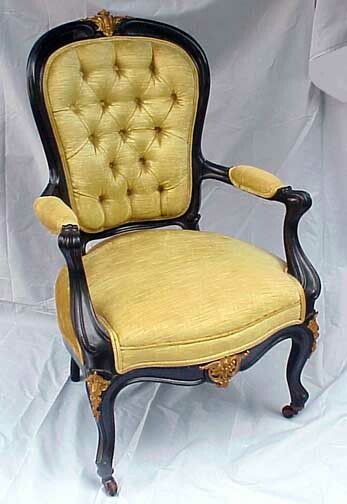 A single parlor chair. c. 1860. American - Rococo Style. Ebonized wood with exceptional well cast furniture mounts. Consistent with production from the workshops of Auguste-Émile Ringuet-Leprince . Condition: reupholstered in the 1960's / the arms are slightly separated from the back caused by loose joints; original finish. Leon Marcotte was the son-in-law of Emmanuel Ringuet LePrince of Paris. 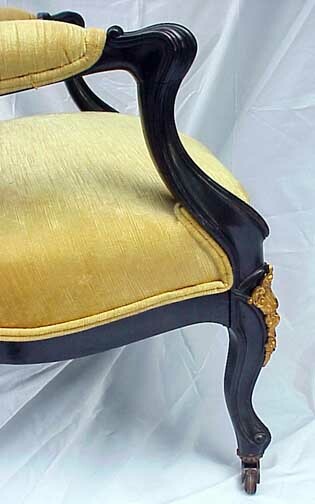 This single chair is similar to a large impressive set made for Chateau-sur-mer of Bellevue Avenue / Newport Rhode Island. 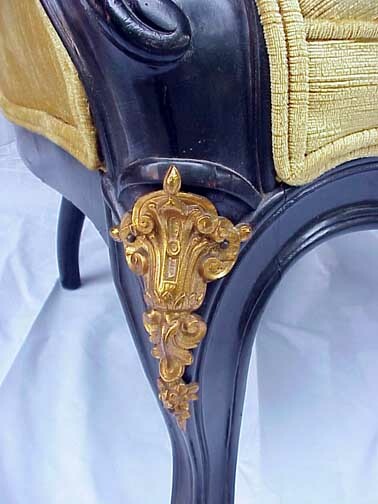 We quote information from the MET in New York about a similar chair that they have in their collection: " Armchair, 1843 Auguste-Émile Ringuet-Leprince (French, 18011886; firm active Paris, 184048) Ebonized fruitwood (apple or pear), beech, gilt bronze mounts, original upholstery; 38 1/2 x 23 1/4 x 26 1/8 in. 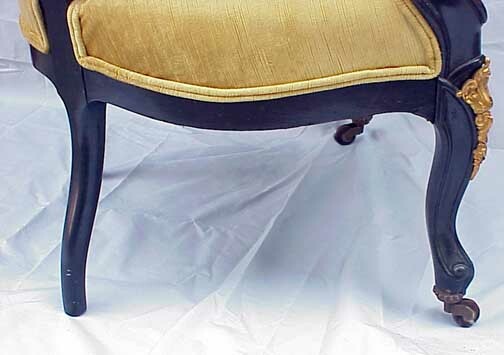 (97.8 x 59.1 x 66.4 cm) Gift of Mrs. Douglas Williams, 1969 (69.262.3) In the 1840s, well-to-do New Yorkers preferred French furniture to that made in their native city. In 1844, Mrs. Samuel Jaudon of New York wrote to her friend Mrs. James C. Colles that "we on this side feel as if everything [is] so much handsomer, and better, and desirable that comes from Paris." Upon orders from New York clients, Parisian cabinetmaker and decorator Ringuet-Leprince shipped entire rooms of furniture, carpets, looking glasses, wallpapers, decorative objects, and sculpture. 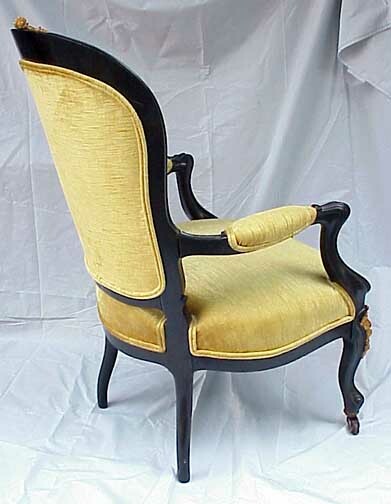 This armchair is part of a formal drawing room suite that was custom-made by Ringuet-Leprince as part of a suite for the abovementioned Colles family. The suite includes a pair of sofas, four armchairs, four side chairs, a firescreen, and a table. In 1850, the Colles' daughter, Frances, married John Taylor Johnston, a New York railroad executive who later served as the first president of The Metropolitan Museum of Art from 1870 to 1889. The suite of furniture descended in the family, original upholstery intact, and, except for two armchairs, was given to the Museum in 1969. " Price: $2,950.00. 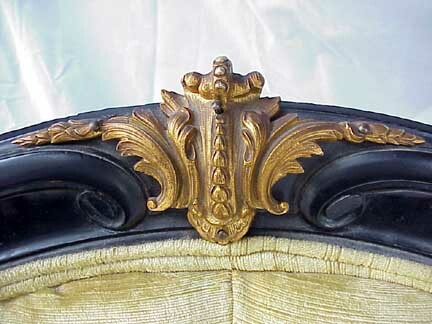 Seat crest furniture mount; heavy cast and fire gilt brass.